The stress-free Motability Scheme package from SDM Toyota offers servicing and maintenance, replacement tyres, road tax, insurance and more are all included with your regular payment, leaving you to focus on your next journey. Picking the Toyota model that is perfect for your circumstances helps you to enjoy driving it to the full, and there are a few things you should think about when deciding. Consider your typical daily journeys and which model is most suitable for them. If you expect to travel long distances to work and back it may be more affordable to own an economical Toyota such as a Yaris Hybrid. It is also crucial to consider your disability when searching for a Toyota through the Motability scheme as not all models may be suitable. Will you need driving adaptations such as steering aids or electronic accelerators? Or access modifications such as a swivel seat? The first thing you need to do to is contact SDM Toyota on 01324 635935. We will book you an appointment with one of our Motability experts, who will be able to quickly assess which cars will best suit your specific motoring requirements. 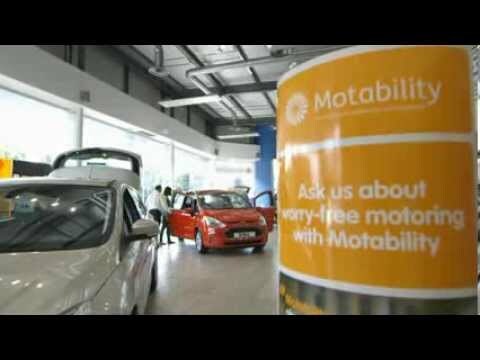 We will support you along the way, and when you have made a decision on the perfect car for you, our Motability specialist will organise a test drive for you. Once you're happy with your new car, we will take care of all the paperwork and details as we process the order.